As a volunteer at Historic Royal Palaces for several years, I was delighted to be invited to work as part of a small group on a long-term project in the handling collection at Kensington Palace. With my background in design, I soon found my ‘niche’ as a plastazote cutter. The disparate historic objects; clothes, china, pottery and everyday objects such as telephones and vanity sets, were lovingly repackaged and catalogued. This has given them new lease of life and made them available as handling objects for visitors and special groups. I thoroughly enjoy being presented with an object, and working out how and where to cut the plastazote shapes, and creating supporting structures. Word got around, and I was asked to help out at the other Palaces too. I’ve mounted coins at the Tower, and packaged some of the handling collection at Hampton Court. The most fiddly plastazote job was mounting a ‘Buddha’s Fingers’ plant, and the tiny skulls of shrews from an owl pellet. Both can be seen in the Shepherd’s hut display in the grounds of Hampton Court. While volunteering there, I became aware of the Royal School of Needlework. 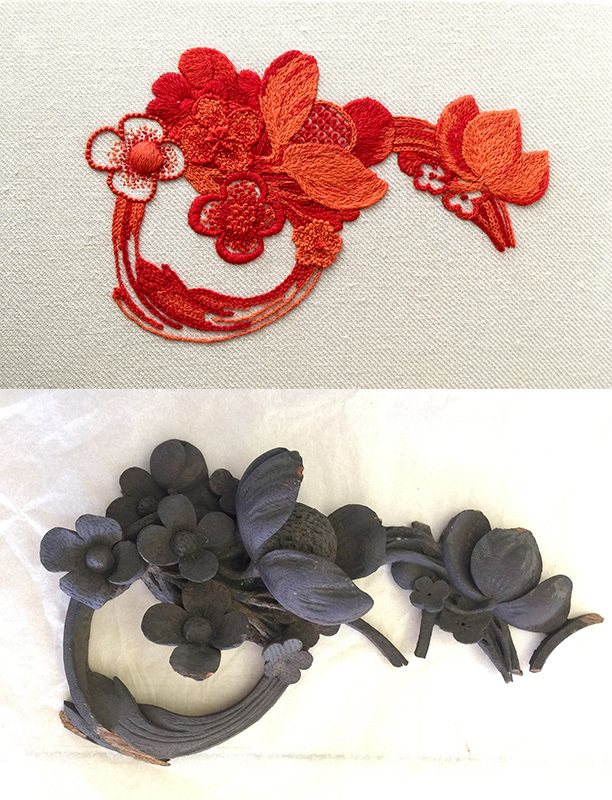 I enrolled on their certificate course, and have been working my way through the historic embroidery techniques taught there. 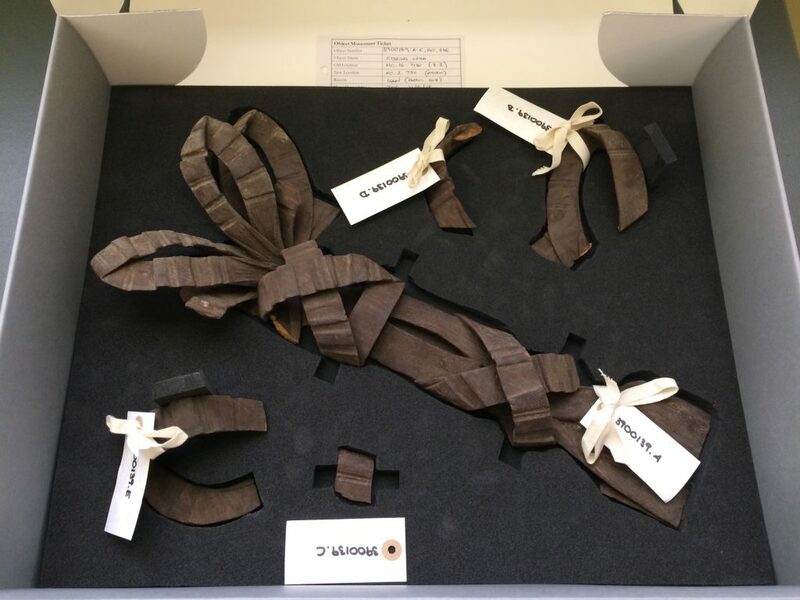 Earlier this year, I was asked if I could employ my plastazote cutting and packing skills to help with a Grinling Gibbons loan to be sent to Fairfax House as part of their exhibition ‘The Genius of Grinling Gibbons‘. The fragments of wood carvings rescued from fire, some blackened and sooty, were yet extraordinarily beautiful. I carefully cut mounts for the pieces so they could be transported safely, and had the privilege of examining them at leisure. The flower heads, swirls and daisies were entrancing; it was incredible to know they were hundreds of years old, and yet looked almost contemporary in design. I started thinking they really lent themselves to an embroidery project in Jacobean crewelwork. Traditionally, this style chooses a Tree of Life with flowers and tendrils as a subject, so the Gibbons carving matched well with the technique. In the following weeks, I completed a crewelwork version of the Gibbons fragment. It is stitched on linen twill fabric, and worked ‘mono’ in nine shades of Appleton orange-red 2-ply wools. The many stitches include satin, long & short, whipped wheel, French knots, couching and trellis. It’s my homage to the greatest craftsman in wood the nation has ever seen, and a reminder that I was honoured to care for some of his work.